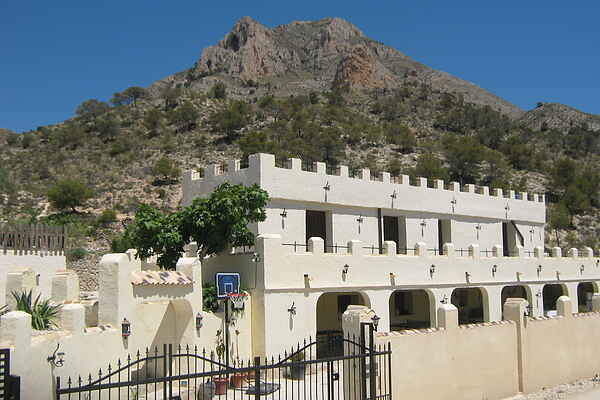 You will be staying at Villa Castillo Las Aguillas (= eagle), a house surrounded by vineyards and almond plantations. An ideal spot for weddings, meetings or special occasions. Also perfect for people who want to leave the crowds behind for a while. The children will have a fantastic holiday here because of the large garden with swings and a trampoline. There is plenty of space to play soccer, volleyball or tennis. There are numerous shady spots and in the evening, after a day of lounging on the deck chairs, its wonderful to have a an outdoor barbecue on the covered terrace. Life is good here. The home owner is very likeable, you can ask him anything. The villa is located between Jijona (5 km) and Tibi (5 km) in the foothills of the MONTNEGRE Mountains. Jijona is famous for its nougat. It is a very old town with pretty little streets. From Jijona you can take beautiful walks to the ruins of a Moorish castle. North of Jijona lies the colorful fishing village of Villajoyosa (10 km). The bodegas of Hondón de las Nieves (10 km) are worth a visit, you can taste fine wines here. Alicante (25 km) is a gorgeous city with a beautiful boulevard, shops and beaches. El Campello (30 km) is especially popular for its kilometres of beach and coastline. New!! the professional Golf Range machine !!! !